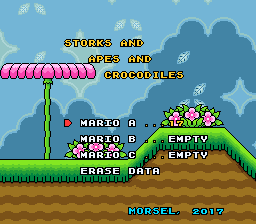 Description: Contains saves for all levels, excluding the first one. MODERATOR'S NOTE: This hack doesn't allow you to revisit already completed levels. That means a completed SRAM would allow access to only the last level. This is the closest we're going to get to a completed SRAM while still allowing access to all levels.